Online PR have always been a popular topic among marketers and social media enthusiasts and I really don’t blame them because it IS an important topic to address and for some reason, I’ve been bumping into some really bad PR campaigns online lately. Take for an example Mayo Clinic where they posted an article on their blog on ectopic pregnancy right beside an ad for ‘cute little dresses’, the recent outbreak of really bad customer service with KFC Malaysia and more recently, with a newly opened shopping mall in Malaysia (see below). I don’t know about you but I got a shock reading the reply from the management or their supposed social media team. You’ve guessed it right – this immediately turned viral where customers started creating photos, videos and tagging their friends into what they are calling the ‘magical moment’. If there’s anything I’ve learnt through the years, consumers want to be noticed and wants an answer yesterday (no, this is not a typo). They are not inclined to know that you are on a holiday or whether it is a weekend. To them, social media does not sleep because they aren’t, and they want to hear from you. Dealing with customers is tough. And it’s normal. There are days where you just aren’t in the mood and here comes this customer with a complain that drives you up the wall. Stop, take a walk and reply positively. It is never, ever a good thing to be sarcastic, unapologetic or to even outsmart a customer – it’ll just make matters worst. A wildfire is the last you want to start online. Sure, mistakes do happen but you must be able to sniff out fire and put them out within the shortest time available. Never let it go unnoticed, thinking that it’ll eventually go away because it won’t. And when it starts going out of hand, things will be harder to fix. What to do if you can’t seem to keep up? If things go out of hand (or you’re already sniffing fire), try bringing the conversation off-grid – whether it is through email, a phone conversation, a direct message on Twitter or Facebook’s ‘message’ feature with the new Timeline update. Politely request for a change of platform and in most cases, customers do comply as they too want their problem fixed. While going off-grid may make things better, you don’t really want to get there in the first place. Make sure your team is well trained to handle situations like these. Have a guideline in place spelling out the do’s and don’ts and make sure the guidelines are readily available. If time is out of your hands, you may want to consider announcing your ‘customer service’ hours. While this is not exactly the best way to go about online, this method will be able to set an expectation among your customers by telling them when will you be available to reply accordingly. Social media platforms have become so important that most businesses today see the need of leveraging on its potential, but there is a greater need to be able to MANAGE these platforms to achieve that potential. Paradigm Mall is just one of the many examples out there and I would love to hear your experiences on other online PR disasters too! p.s. 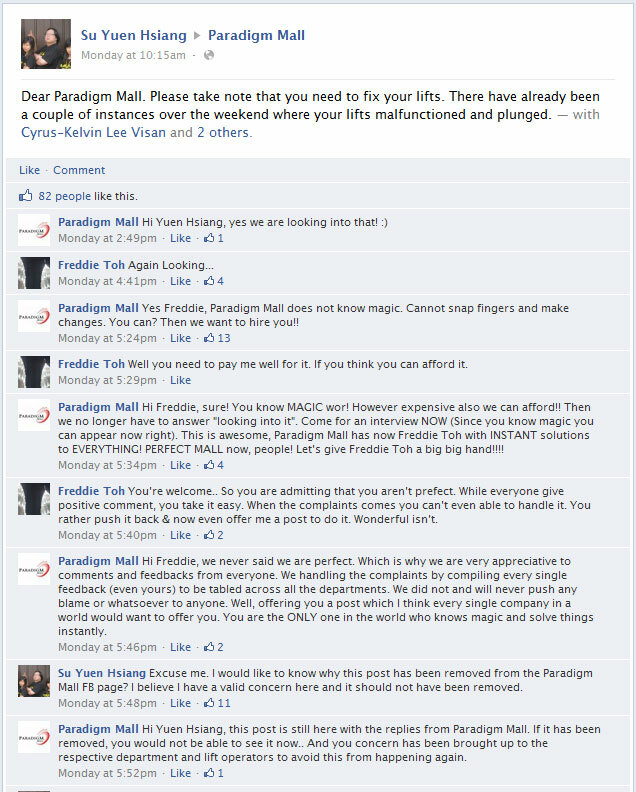 The management of Paradigm Mall publicly apologized on their Facebook page a couple of hours after the incident and to that, a job well done!